Anyone who hasn’t played the original on DS shouldn’t bother at this point. The remake is better-balanced and better-looking, arriving with a fair bit of extra side content as well. For everyone else, it’s worth remembering that you can still play DS games on your 3DS, and unlike 2017’s remake, Mario & Luigi: Superstar Saga, which originally released on Game Boy Advance in 2003, Inside Story + is a less radical upgrade. I played the original on DS, but I’m still very happy to be playing the remake, too. The Mario & Luigi games are, in my opinion, some of the most beautiful games ever released on Nintendo’s handhelds. These role-playing games are based around the concept of controlling Mario and Luigi at the same time using different buttons. They’re known for being funny, too. They’ve also just looked great. The series jumped from Game Boy Advance to DS in 2005 with Mario & Luigi Partners in Time and stuck with a rich, densely-pixelated art style at a time where other Mario games, like New Super Mario Bros. on DS, were chasing a slick look established on home consoles. The color and warmth of that style has been preserved in this Inside Story remake. Inside Story, like the Superstar Saga remake before it, doesn’t make use of the 3DS’s stereoscopic 3D capability, which is a bit of a let down. Still, the game does use the jump to better hardware to offer better graphics with more visual depth. The remake brings out the different layers of art with more contrast between backgrounds and the action taking place in front of them, and make battles feel more fluid, but none of it compromises the vibrant greens, yellows, and reds splattered throughout the Mushroom Kingdom. The graphics are slightly more realistic and detailed, but not less exaggerated and whimsical. I wish more remakes could nail the balancing act of combining visual upgrades with highly-stylized art the way Inside Story does. Narratively, the game is basically unchanged, at least from few hours I’ve played. The Blorbs disease still threatens the land by creating engorged Toads and Goombas. Bowser is still conned by the series antagonist Lord Fawful and consumes a mushroom that leads him inhale everything around him, including Mario, Luigi, and Peach. 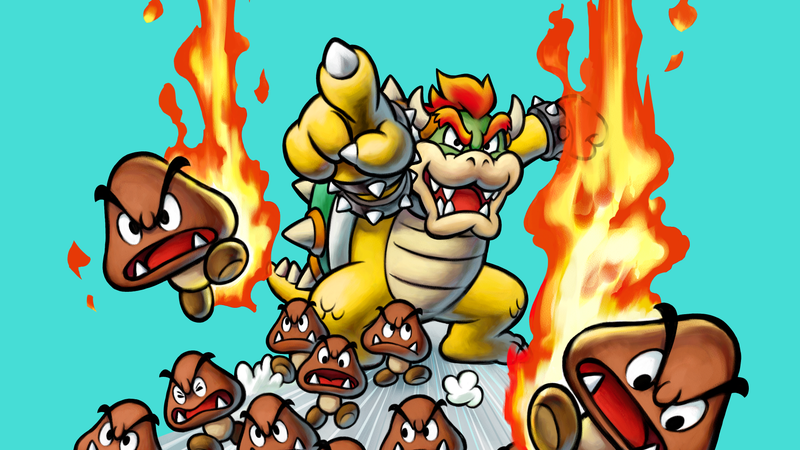 While they explore Bowser’s body, Bowser tries to take back his castle which has been taken over by Fawful, a dichotomy responsible for some interesting battle mechanics and story set pieces that invite the player to interact in novel ways. The developers at AlphaDream have tinkered with some things like combat, making special attacks cost different amounts of Special Points instead of all being the same. Ranks have also been reworked similar to the Superstar Saga remake. Characters can now equip up the three accessories at the default rank (Mushroom), and higher ranks, earned by leveling-up, bestow rank-up bonuses that increase stats instead of additional accessory slots like in the original game. From what I’ve experienced, these shifts add a little more depth earlier into the game, but aren’t drastic improvements. Inside Story + is still JRPG-lite. Like the rest of the series it channels some of the role-playing feel of Paper Mario. It’s the storytelling and interesting action sequences that make the game entertaining. Inside Story’s writing is still some of the best in games and I’ve been consistently chuckling at characters’ bizarre speech tics and quirky senses of humor. As someone who rarely finds humor in games, this feels like no small feat, especially for a game that’s now a decade old. The writing in the new side portion of the game, Bowser Jr.’s Journey, is almost as good. As with the Superstar Saga, this Inside Story remake comes packaged with a new, original campaign that tells a story happening in parallel with the remade game. For Superstar Saga’s Bowser’s Minions campaign, that additional content focused on the trials and tribulations of Captain Goomba, who was still pretty generic. This time, we get the story of Bowser Jr. and how he deals with setting out on his own to try and impress his father while the latter’s world is falling apart. At times I felt sorry for Bowser Jr. Other Times I shook my head in disgust. Mostly I just laughed, if not at him than at the poor minions whose fate it is to forever be his babysitter. Like Bowser’s Minions, Bowser Jr.’s Journey’s story sequences appear after sequences of squad battles that play out as light strategy games. In these squad battles, you select up to nine characters to assist Bowser Jr. in brawls that unfold automatically. Every character has its own level, stats, strengths, and weaknesses, making the composition you select for each fight crucial to winning. Bowser Jr.’s Journey adds some more layers of strategy to squad battles but it’s still far from a perfect formula. Last time around they got to be overly repetitive, and while I can’t yet say that’s changed with Bowser Jr.’s Journey, they do have more strategic depth. In addition to being able to select different Koopalings to assist you in fights, you can also nominate them or other minions to be sub-captains, in which case they’ll add their special abilities to your arsenal. The formations you use in fights can also lead to special, coordinated attacks between groups of characters that can then be made more powerful by pressing the A button at the right times. They’re small changes but make each brawl require more thought and also feel more interactive. Anyone who didn’t enjoy these quasi-real-time-strategy battles in the Superstar Saga remake is unlikely to fall in love with them this time around, but they’ve definitely improved. I’d love to have gotten a brand new Mario & Luigi game this year, or even a remake that was on Switch instead of the 3DS. Still, a remake of Bowser’s Inside Story, one of the best games in the series, is better than none at all. I’m enjoying reliving the high points of the story with the beautiful, upgraded graphics and have found a surprising amount of fun in guiding Bowser Jr. through absurdist misadventures with the rest of Bowser’s minions. The Mario universe has become so much bigger in the years since Inside Story was originally released. It’s nice to be able to spend time with some of the under-explored characters on a smaller scale.